The map collection contains about 1,900 maps. 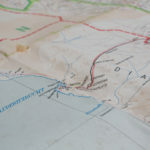 Its geographic emphasis is on Namibia, including topographic, geological and historical maps as well as city and road maps from the 20th century. Other African countries are also represented in the collection. It also holds the official map series South West Africa 1:50,000 Topo Series, which constituted the standard at this scale until 1998.